The legendary Rio Grande - an icon of the American Southwest - flows through some of the most beautiful and desolate desert canyons on the continent. 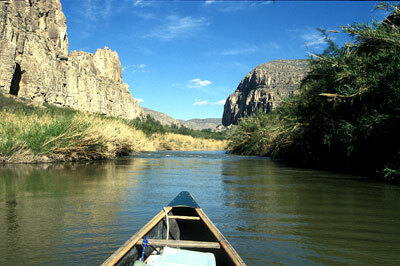 Forming the long, wild Texas/Mexico border and cutting through the intensely rugged Big Bend Country, the “Lower Canyons of the Rio Grande” is truly one of America’s premier wilderness river trips. Not fully surveyed in its entirety until very late in the nineteenth century, the Rio Grande is a still regarded as one of the country’s last real frontiers. 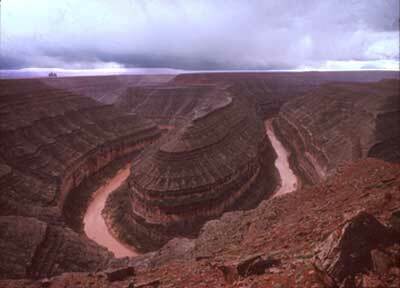 For 28 years we have run what is known as The Lower Canyons - the most isolated and spectacular section of all. Flowing eastward out of Big Bend National Park, the river is first characterized by massive buttes and peaks rising off the desert flats, which eventually give way, to the Rio Grande’s most commanding feature; the succession of canyons - miles of sheer, subtly hued walls, at times thousands of feet high. Wild horses and burros roam side canyons; vultures, falcons and hawks fly overhead. technical rapids (mostly class II), virtually all of which are runnable. 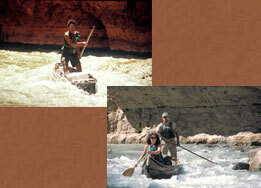 Whitewater technique, especially solo paddling and poling, has always been our specialty. Given the proper coaching, most people can be taught to run whitewater gracefully and skillfully within a few days’ time. 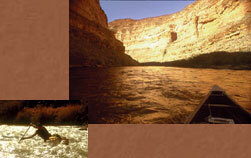 We run the river at optimum season — late March through April is “springtime” in the southwestern desert. Cacti are flowering and the climate is perfect; fairly hot and dry, with an abundance of sunshine, no bugs and perfect swimming. Highlights include dramatic hikes up adjoining bluffs and side canyons, bathing in natural hot springs, and Southwestern cuisine. Campsites reflect the diversity of the landscape; each one is different — seemingly more beautiful than the last. Although tents are provided, many just simply choose to sleep under the stars. 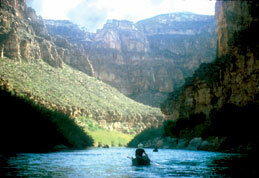 New for 2006 - For 28 years, Sunrise has had a tradition of running springtime trips on the Lower Canyons of the legendary Rio Grande - along the Texas/Mexico border. An icon of the American Southwest, the Rio Grande flows through some of the most beautiful and remote desert canyons on the continent - and is still regarded as one of the nations’ last frontiers. 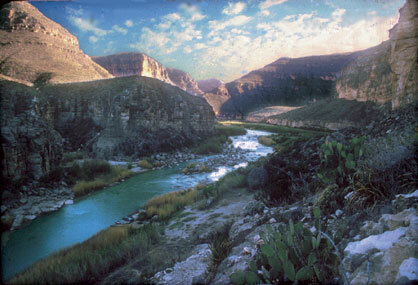 In 2006 we are presenting a new, somewhat leisurely option, for those wishing to savor the beauty and ambiance of West Texas, the Big Bend, and the Rio Grande - within a shorter 4-day time frame. Primarily flatwater and short, easy Class I-II rapids, this portion of the Rio features the smaller, more intimate canyon landscapes of Boquillas Canyon, linked with the uppermost reaches of the Lower Canyons - with a take-out at Maravillas Creek. This trip also includes an overnight in the picturesque and historic West Texas town of Marathon - the last civilization north of the Big Bend. 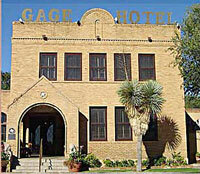 Accommodations are with the famous restored national landmark hotel - The Gage, or the Marathon Hotel Visit the legendary White Buffalo Bar and gourmet Cafe Cenizo. This trip provides a relaxed 4 -day desert canyons getaway, with a historical perspective, and is certainly ideal for those looking to incorporate a river trip into their Southwest vacation. Melting snows high in the majestic peaks of southwestern Colorado’s San Juan mountains give rise to a major tributary of the Colorado River — the San Juan. Cutting deep through the slickrock country of Utah’s legendary Canyonlands, in the heart of Navajoland, the river is characterized by towering redrock canyons and elaborate stratigraphic formations - truly one of the great southwestern rivers. Perhaps it’s most renowned feature is the rich display of prehistoric life. Called Anasazi, “the Ancient People,” by the Navajo Indians who succeeded them, this mysterious early civilization built elaborate cliff dwellings - which are amazingly well preserved - as are their spiritually symbolic petroglyphs. Miles of high volume good current are interspersed with numerous Class II, some easy III rapids - making the river eminently canoeable, with no portages. 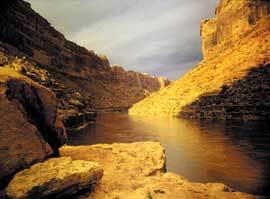 Numerous spectacular side canyon hikes and trails and evening swims in natural pools. We visit as spring arrives; definitely a unique …and spiritual journey. Anasazi Ruins - "River House"
The Verde River is one of Arizona’s larger perennial rivers; featuring classic, fantastic Southwestern landscapes, and true wilderness settings. There are several notable prehistoric sites (cliff dwellings and pithouse ruins, for example) located along the river corridor. Several threatened and endangered species inhabit the area including the bald eagle, peregrine falcon, spike dace (a native fish), and river otter. 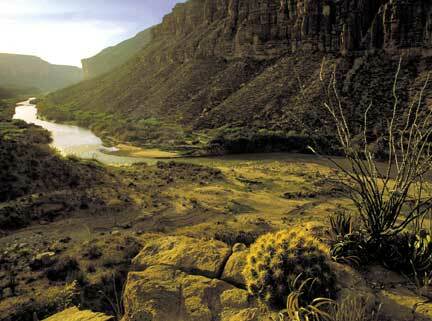 A portion of the Verde has been declared as a national Wild & Scenic River by the U.S. Congress. This river consistently receives RAVE REVIEWS from our clientele. The river is technically demanding with many ClassII-III+ rapids; a few Class IV ledge drops may require lining or portage.